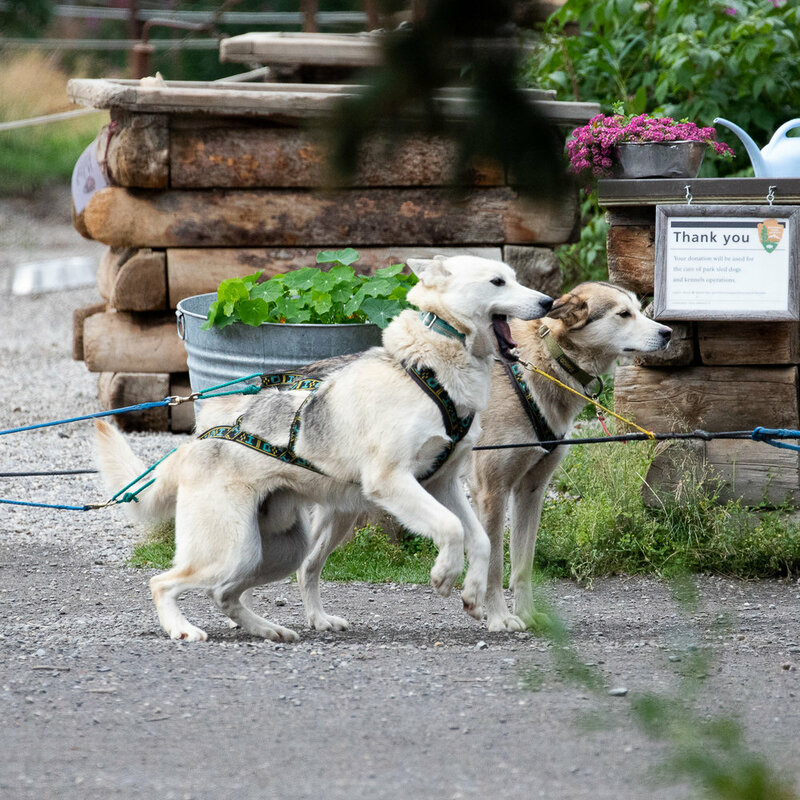 One of the highlights in Denali National Park was visiting the dog kennels and observing a sled dog demonstration. Denali National Park is the only national park in the United States that has a working sled dog kennel; approximately twenty-five dogs perform essential duties in a vast expanse of designated Wilderness area of the park during the winter season. 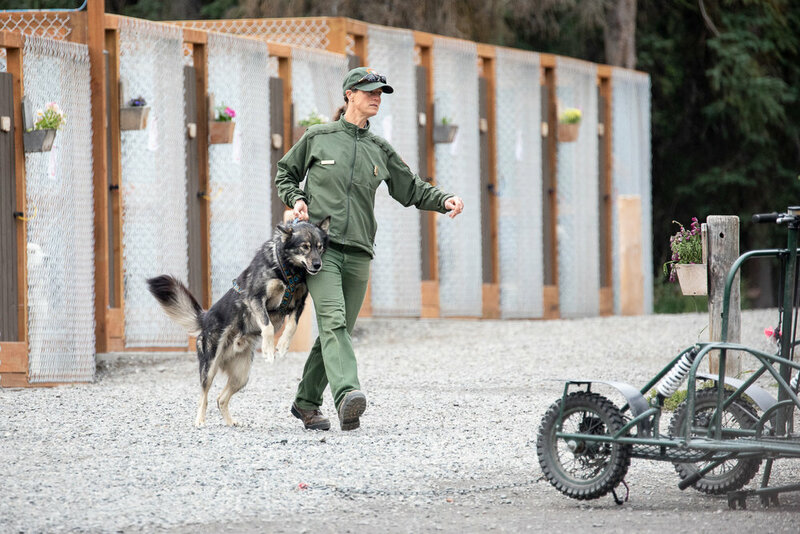 Each year, an average of 3,000 patrol miles are logged throughout the park's interior, all on the back of sleds pulled by the Alaskan huskies which live year-round at the kennels of Denali National Park. During the summer, attendance at the daily sled demonstrations totals over 50,000 annually. The highlight for visitors comes when five dogs are hitched to a wheeled sled and a naturalist takes the dogs for short runs on a gravel track around the kennels. Photos from my visit are below. Denali National Park has had sled dogs since 1922. The first Superintendent of Denali National Park, Harry Karstens, purchased the first seven sled dogs for use patrolling the newly established park boundaries. The park has maintained working dog teams ever since. Their job has evolved over the years and they are no longer patrolling for poachers, but they are still performing essential work. Because over 2 million acres of Denali National Park and Preserve is designated by the federal government as wilderness (the highest level of protection for public lands in the United States), no mechanical or motorized machines (such as snowmobiles) are permitted. This is where the sled dogs play an integral part in in providing transport for many projects in Denali during the winter months. For instance, scientists use the sled dogs in Denali to haul research and monitoring equipment in the Wilderness. The Alaskan Husky is not recognized as a standardized dog breed by any major kennel club; instead, the Alaskan Husky breed is defined only by its purpose, which is that of a highly efficient sled dog. There is no breed standard appearance required of Alaskan Huskies: they come in all different shapes, sizes, and colors (as you can see in the photos below). However, there are some consistent physical traits that all Alaskan Huskies share (and that they share with other northern pulling breeds like Siberian Huskies and Malamutes). These common traits include long legs for breaking trail through deep snow, tough feet, a good, thick fur coat and a nice, bushy tail to keep them warm in Alaskan winters. In addition to the physical traits, they also need to have certain mental and personality traits that make a great sled dog including a love of running and pulling, and a strong connection to people, yet the independent confidence to make decisions while leading a team on the trail. Denali National Park has a video series on how the Alaskan husky puppies are raised and trained to become sled dogs. 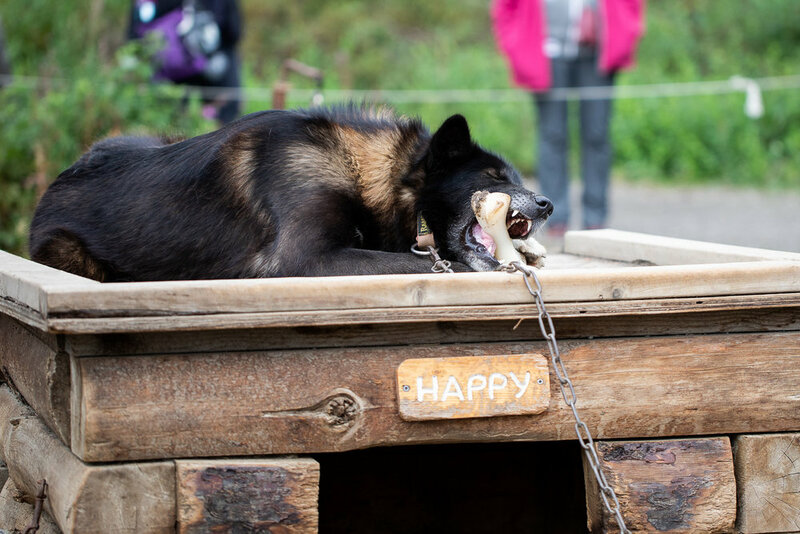 After a ranger-led twenty minute discussion of the sled dogs kept at Denali, visitors were treated to a demonstration of the dogs pulling a cart over a short track. The park ranger on the microphone explained that as the sled dogs are brought out, they are picked up by the collar and walk on their hind feet. This approach does not hurt the dogs and they are trained to walk this way since they are puppies. Walking the dogs to the sled in such a manner also protects them, as the ranger handling the dog will not accidentally step on the front feet of these working dogs. Bringing out a sled dog for the demonstration. Getting ready to be harnessed. Walking toward the summer cart. These dogs were so excited for the run around the track! All five dogs on the summer track at Denali National Park. Around the bend they go. The home stretch in front of dozens of park visitors. The park rangers on the cart look pretty happy. After the run around the summer track, visitors are allowed to go interact with the Denali sled dogs. Some of the dogs are kept in their own kennels, while others are in an open environment where visitors can touch the dogs (the dogs are secured by a long leash). The primary instruction provided by the park rangers was not to try to pet or call out the dogs that were in their dog houses (they need their break from human interaction!). "Enter the Matrix." (Matrix is the name of the dog, not the doghouse). S'More taking a break. S'More is one of the shier dogs in the Denali kennels. Happy chewing on a bone. The dogs appreciate shoulder and back rubs from visitors. 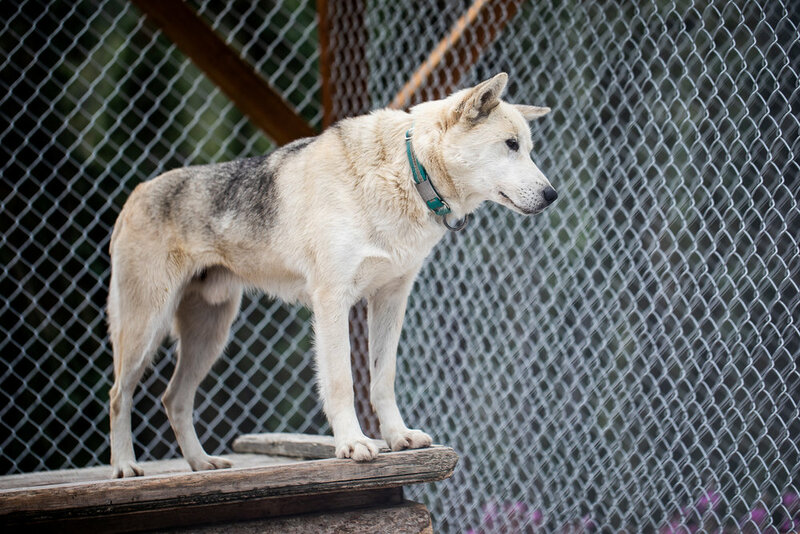 The Denali sled dog kennels are located about 3 miles inside the park. The kennels are open year-round to visitors. In winter, the dogs and rangers are frequently in the park rather than at the kennels, so you may wish to inquire at the visitor center before coming to see if the dogs are around. The dog kennel demonstrations (run from around June 1 through September 1) happen three times daily at 10AM, 2PM, and 4PM. You can take a free bus (Sled Dog Demonstration Shuttle) from the visitor center to the dog kennels about 40 minutes prior to the starting time of the demonstration. Alternatively, you can walk 1.5 miles from the Denali Visitor Center to the kennels. The sled dog demonstration is highly informative (and entertaining!) and should definitely be a stop on your itinerary to Denali National Park (whether you're visiting for half a day or longer).